This 100% acrylic six panel officially licensed US Army cap features an embroidered US Army Retired on front. 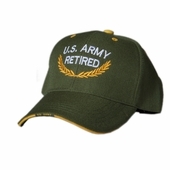 The curved bill has embroidery and a woven label to show your support for the Army. The velcro closure allows this cap to be one size fits most.